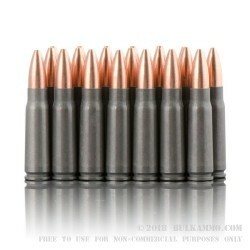 The 7.62x39, also known as the "762 AK", or "AK round", is one of the most infamous, iconic, well-known, and straight up deadliest cartridges in the history of ammunition. It was first designed during World War 2 in 1944, although it did not originally serve in the AK47. It was used in the SKS rifle before the AK47 was graced with the 762x39. Initially, when the AK47 began to be issued to the Soviet troops, each soldier was given a canvas rifle case and was instructed to keep the rifle covered at ALL TIMES. The Soviets did not want any other country seeing their advanced "assault rifle" design or the bullets that went with it. The 7.62x39 round has seen service since 1944 and is still in common use today in countries all over the world. 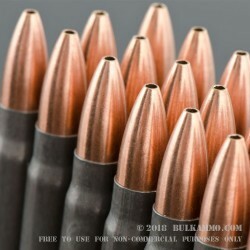 These Tulammo 7.62x39 rounds are the 124 grain weight bullets, with a hollow point, lead core, copper jacketed design. 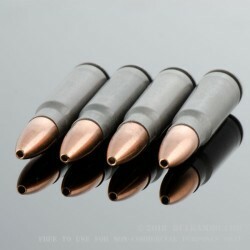 These bullets are loaded into new manufacture, high strength, non-reloadable, Berdan primed non-corrosive, grey colors steel cases. These feature an impressive muzzle velocity of 2396 feet per second, ensuring a hard-hitting impact on anything you hunt. This ammo is made in Tula Russia, and each case contains 1000 rounds, packed up factory-tight in 50 boxes of 20 rounds each. These 1000 round bulk cases weigh about 42 pounds, and they will stack quite well in your big safe or in your personal armory. Once you get yourself a few cases, don't hesitate to get a few more so you and your family can have days of plinking fun. i shot 100+ rounds of this ammo i got from my local shop, i have no complaints. no misfires, was accurate and consistent. when i saw the reduced price it was a no-brainer to buy the 1000 rounds. I would buy it again! 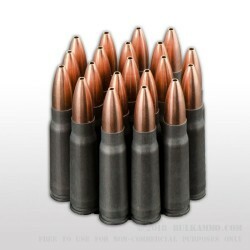 This ammo is a great price and great range ammo! I Do not have any thing negative to say about this ammo. I gave it 4 out of 5 stars on performance just because I have not shot a lot of it yet. No problems to report at all at this time. 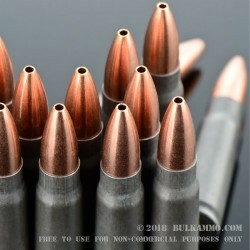 Great ammo for the money! The AK devours it no problem! I got this ammo within 5 day of ordering it, once again another flawless transaction from BulkAmmo.com. I've short a few hundred rounds so far without any fails in my VEPR AK. I have shot Tula 39 and 54R from various sources. My SKS loves it and I hit 3 of 5 on a 400 yard man-size steel gong, 4 of 5 on a 300 yards gong and 5 of 5 on a 200 yard 3x3 feet 1/4' mild steel plate mostly penetrating. Nothing wrong with that ammo. My friends Mini 30 does not like it too much, no wonder! Tolerance problems, I guess. The FMJ version works better in the Mini 30 and in my SKS is a little more accurate than the HP. Q: Are the bullets themselfs magnetic? Posted On: 9/18/14 By: Carl C.
A: Hello Carl, These 124gr. 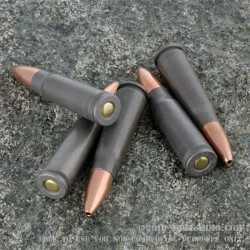 HP rounds by Tula in 7.62x39 have a lead core, but they sometimes use a bi-metal jacket so they do attract a magnet. For non-magnetic rounds, I would suggest a brass cased round. A: Hello Matthew, Yes, these 124gr. HP rounds by Tula in 7.62x39 are non-corrosive. You can safely shoot them without having to worry about corrosive primers.